Mondays, Wednesdays & Fridays from 1:00PM to 3:00PM. 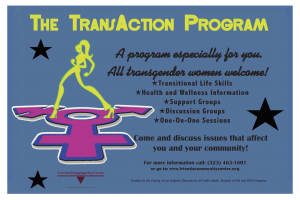 A social support group for transgender women at any stage of gender transition, many participants are in a marginal or transitional living situation. Facilitated by Friends Community Center. Enrollment: Open. Call for more info 323-993-2900.